Hellllllllllllllo everyone, long time no post! So, first thing’s first: sorry for going dark for as long as we did, especially when that gap of time included a few holidays we typically give reports on. The excuse is simple, but maybe not satisfactory: there was just a decision to focus on asset creation rather than promo images and stuff for the holiday posts, and as far as progress reports go, we’re stuck in that “nothing much to say” mode since the rest of the workload is largely just burning through a whole lot of coloring and programming. Sorry if this made you assume the worst, if things ever do go south we’ll let everyone know ASAP, so please continue to believe in us, even if it gets quiet! So anyway, we’re here now, so let’s talk. First off, here’s something we’ve been promising for a hot minute: a preview of a new, finalized sprite. All of Eileen’s sprite work has been fully colored and finalized at this point, and given First Snow’s focus and relatively smaller roster of characters, Eileen alone being finished allows us to finalize a LOT of FS. Our sprite artist, Aco, is currently in the middle of some real life woes, so we’re moving onto getting some other coloring/misc work done until he gets back. Eileen’s going to be plugged into the build during this period, and we’re hoping that by the time he’s able to resume sprite art we’ll have most of our small errands completed so we can focus entirely on sprite and cg coloring. Now that Eileen’s done and things are coming along, we believe we’re in a position where we can share screenshots more readily. There’s hesitation to commit to a schedule (since we’re so great at following them, clearly) but we’d like to post at least one new screen a month to our Twitter account if we can help it. 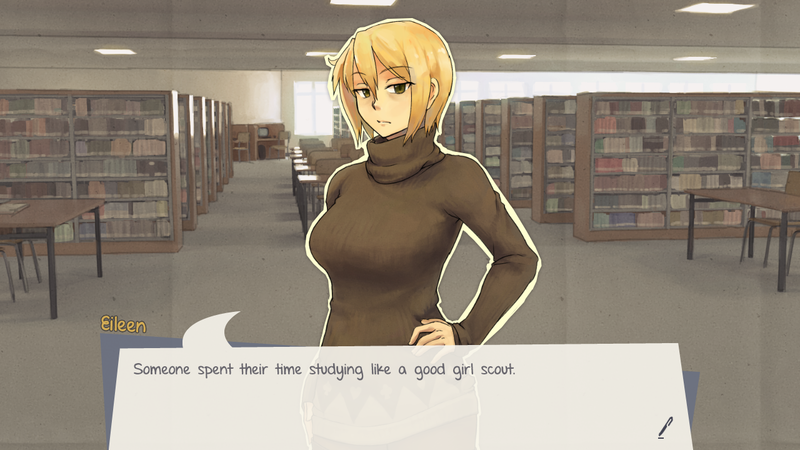 Other things to look forward to in the realm of soon-ish: we’ve recently found the need internally to redo the Twofold character bios + the actual VN summary to use as reference. While updating the actual key art on our web pages is bottom of the bottom priority until First Snow is pretty much shipped, we’d like to update the text on those relatively quickly. There are some elements that are really outdated (Oliver) or misleading (the VN summary and its focus on Oliver’s GPA as opposed to our core themes) that we’d like to correct to give everyone a better idea of where we’re at currently. The next sprite on our to-do once Aco returns is Rose, a character we showed off in older First Snow screenshots who we haven’t really elaborated on. While we want to keep the rest of the FS cast and what Twofold characters will/won’t be in it in the dark for now, we’ll definitely show off the new Rose as soon as we can. And that’ll about do it for now! Sorry again for the wait, and thank you for continuing to follow us after all this time. I'm still waiting on my waifu sim, TJ! Thanks for the update. I was starting to get a bit worried, so this is some really good news. Ganbaruby!